A trick weapon wielded by the old hunters. allowing one to lash it int he fashion of a heavy whip. 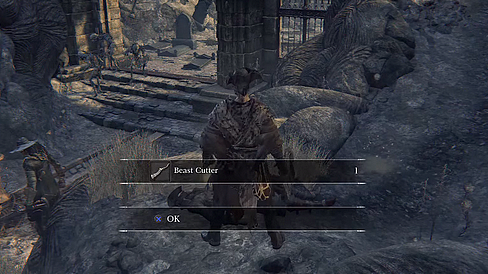 The Beast Cutter requires 11 strength and 9 skill to use. This weapon is quite similar in function to the Threaded Cane, but serves instead as a strong alternative for strength focused characters. This weapon excels wonderfully in its versatility, but even more so with its impeccable range when transformed. Blunt damage is the Beast Cutter's forte. However, this is the only type of damage it inflicts. If you are using this as your main weapon, you'll want to carry a secondary option, unless you plan to brute force your way through things. It also receives a 20% damage bonus when used against enemies weak to serration in both modes. Normal Mode: The Beast Cutter's normal mode acts like a club with a basic, solid moveset. In this mode it relies primarily on quick, close-range hits; likewise, tackling single or a few closely grouped enemies is what it does best. In comparison to the transform mode, it is overall faster and less demanding of your stamina. Transformed Mode: The Beast Cutter is a devastating weapon when used in transformed mode. In stark contrast to normal mode, attacks can reach exceptionally far and have great impact. The only drawbacks are its heavier stamina usage and slower swing speeds. Despite these shortcomings, the increased range and impact are what make this mode great. The most apparent of options is to use Adept (blunt) effect gems. Since every one of the Beast Cutter's attacks is blunt type, this will greatly boost your overall damage. Considering that the transform mode drains large amounts of stamina per swing, another good option would be to slot Radiant gems to this weapon. The Beast Cutter's extended range when transformed will allow you to easily counterhit enemies from a distance. This makes for a viable tactic, only further enhanced by Finestrike's particular bonus. Additionally, as this weapon scales best with strength, you may want to consider slotting it with Heavy gems. Lastly, Striking gems should also be taken into consideration; these can be used to bolster the normal mode's already powerful charged R2 for massive damage. For more information check the Best Blood Gem Setups page. Normal Mode: The Beast Cutter's R1 chain is the quickest way to dish out some solid damage. This chain has a decent damage multiplier and swings from a variety of different angles. After the initial overhead swing, the rest will move in a diagonal or horizontal manner. Though this weapon is not recommended for handling groups of enemies, this string can be useful for fending off approaching enemies mid-combo. Quickstep R1s deal slightly less damage than the weapon's attack rating, but are quick with good forward momentum. The charged R2 is without a doubt this weapon's strongest attack. Charging this is slow but with a damage multiplier of 1.90 it's well worth the wait. It can stagger when it connects with an enemy from behind, at which point you can follow through with a visceral attack or second charged R2. For a wide single strike you can use the standard R2; its forward momentum is great for hitting approaching enemies. No other attack breaks enemy super armor as easily as the jumping R2. Performing this attack will expend a lot of stamina, but deals good damage and it can even cause some stronger enemies to stumble heavily and instantly upon impact. Using this attack twice in a row is usually a bad idea. Most enemies will recover from the first and hit you during the startup of the second, so it's better to escape and regain your stamina. Transformed Mode: The R1 chain swings in wide arcs ahead of your character and covers a decent amount of distance. The R1 chain has a damage multiplier lower than the weapon's attacking rating and consumes more stamina than the normal mode; however, its specialty lies in crowd control. These attacks are also useful for fighting in tight spaces; though they can rebound off walls or obstacles, they won't unless you're directly facing one. If you need to use close range attacks without transforming to normal mode, rolling and quickstep R1s have you covered. Although these attacks are more stamina-intensive than their normal mode counterparts, they receive the full attack rating of the weapon. Take note that the dashing R1 uses the exact same damage multiplier and amount of stamina as the normal mode version. The R2 is one of this weapon's best attacks by a long shot. Not only does this attack have incredible range, but it also utterly shreds through enemy super armor, causing even some of the largest of foes to stumble. In addition, the follow-up R2 has heavy impact and will allow you to flatten foes from a distance. A great tactic you can use is to ready this attack as an enemy approaches the tip of your range and hit them before they can react. With the correct timing and spacing, you can afford yourself relative safety during attacks. Orphanage Key Skip in Upper Cathedral Ward: You can kill the brainsucker holding the key to Orphanage through the door if you have a weapon with long reach: Threaded Cane or Beast Cutter. You will automatically receive the key when the brainsucker dies. Durability of the weapon depletes when used. This means hitting an enemy, destructible object or bouncing off the walls. Hitting undestructible objects and environment does not deplete your durability. Style of an attack or upgrade of the weapon, even different weapon, does not matter - each count as one hit. Every 10th hit against the enemy/object depletes 1 durability. Exception is Tonitrus, which when in self buffed mode, depletes durability at rate of 2 hits. Hitting an enemy in dying animation still counts as hit. Also hitting multiple enemies/destructible objects at once counts as one hit per enemy - hitting 3 enemies at once counts as 3 hits towards durability counter. Shields lose 1 durability every 10th hit. Bounce means when your hit is bounced back off the wall or other objects. Every 5th bounce depletes 1 durability. Not every weapon can be bounced off, Beast Cutter belongs into the category which can. Damage reduction when heavily worn. When weapon is at 30% of total durability, it reaches the Risk state and AR is reduced by 30% and when it hits 0% of total durability, weapon is Broken, then AR is reduced by 50%. Beast Cutter which has 230 points of durability reaches risk state at 69 Dur. Workshop's Repair: cost of repair depends on the weapon and its upgrade. 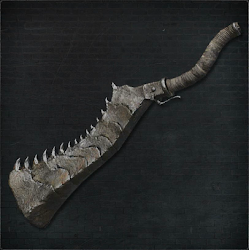 For Beast Cutter +0 it's 2 Blood Echoes per 1 point and for Beast Cutter +10 it's 8 (values are rounded), full repair costs for +10 are 1800 Blood Echoes. 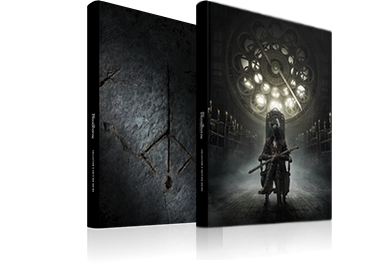 Note: Damage Multiplier data from official guide checked with http://darksouls2verificationdata.web.fc2.com/motion-bloodborne.html for correction after patch 1.09. Attack: Attacks are named for the input command required to execute them. Attack Damage Multipliers: Each attack has a different multiplier. Your attack's power is equal to the attack power of your weapon times this multiplier. Higher multipliers mean stronger attacks. Type: Damage type determines which gems will boost your attack and which defense the enemy will use to reduce the damage. If multiple types are listed, the attack has two separate damage components that are calculated separately. Stamina: Each attack costs a different amount of stamina. Numbers in parentheses indicate the cost of the additional action required to execute the attack. For example, a backstep attack requires a backstep, which costs 10 stamina. Impact: When you hit an enemy, it will be stunned momentarily. Impact is an assessment of how heavy the stun will be. The scale is Light > Normal > Heavy > Massive. Attacks with Massive Impact often cause knockdowns.